Been fishing the estuaries? Let us know how you went. 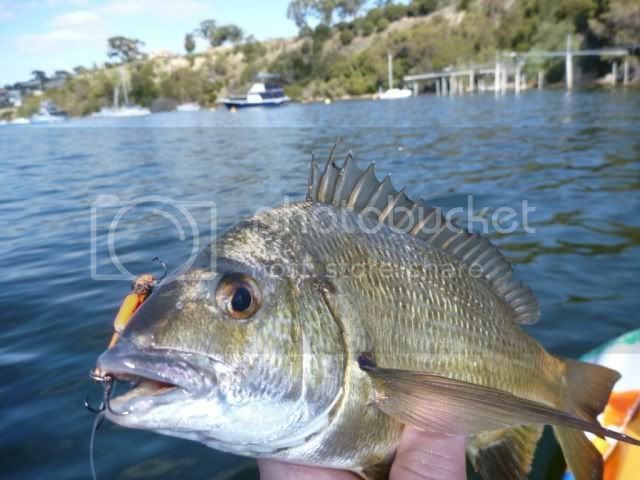 The lower Swan River has been kind to me lately, so today I launched near Blackwall Reach again armed with some bream lures. Launching into some more beaut weather on a tippy top high tide, I was soon drifting along Blackwall Reach peering down into the clear water. As usual, 5 metres below me there were loads of bream , some large ones and some big schools. 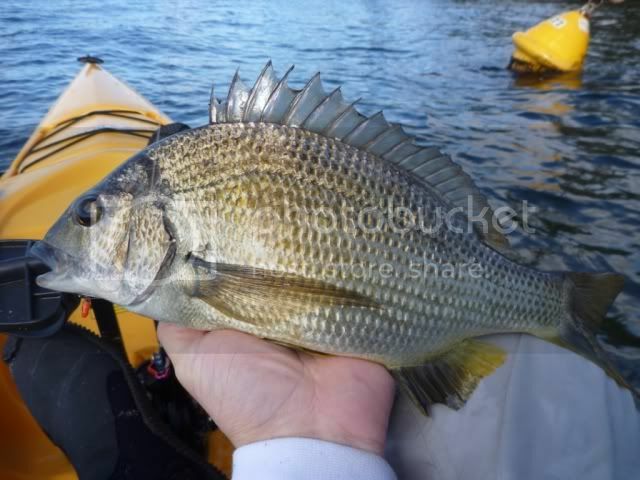 Blackwall Reach bream are pretty damn frustrating though, and dropping every sinking lure I had right amongst the schools achieved nothing apart from a lone blowie. 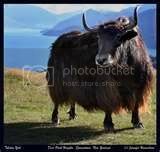 I did meet two yak fishos in Hobie Revoâ€™s, gâ€™day guys if you are reading this. Moving on, I headed to a different part of the river. After a long fast pedal I realised Iâ€™d reached a good spot when a cormorant surfaced next to the yak with a 30cm bream flapping in his beak. Casting the basstrix lures that were so good last week yielded nothing but bitten off tails from the plague of blowies that had returned. 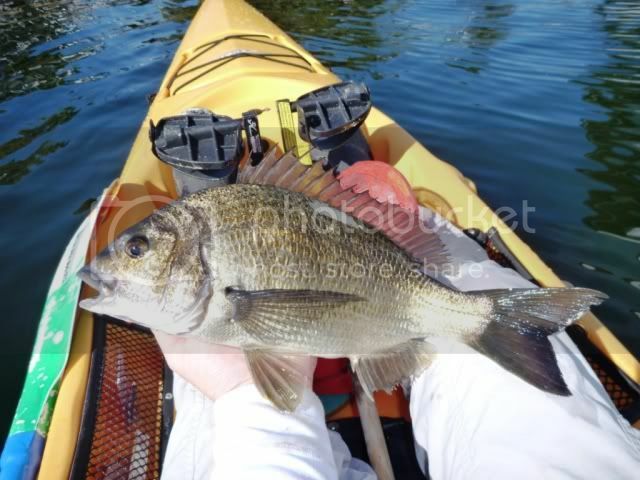 I did have two follows from good bream in shallow water, who took off right next to the kayak. 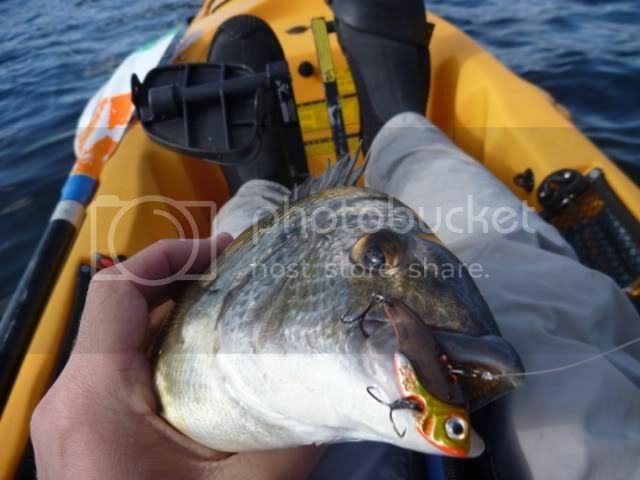 Unhooking him, I was wondering why the bream was bleeding so much when I realised it was my blood. I had cut one finger quite deep when collecting the mussels, so when they ran out soon afterwards it was back to lures (which are more fun to use anyway). A blade was tied on and stayed on the rest of the day. 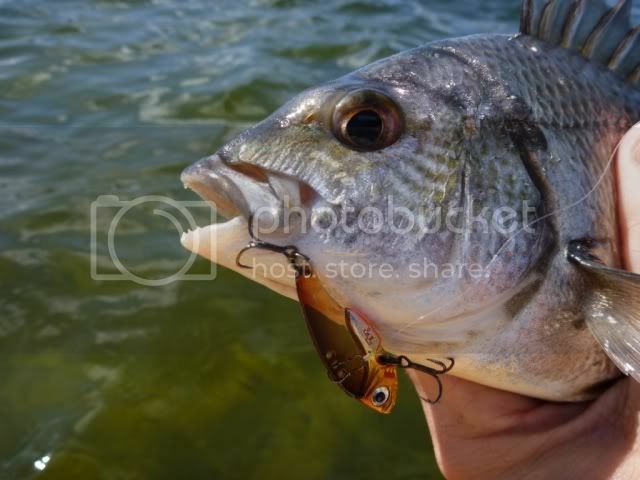 Plenty of schooling bream in the 25-30cm range about â€“ hooking them was hard though. Soon I found my favourite spot and cast in the exact same place as I hooked that 41cm bream last week. After releasing two fish around 30cm, a 35cm fish took a liking to the blade and put up a hard fight.. So, another great Sunday afternoon and a great way to relax. The lower Swan is quickly becoming my favourite lure spot. 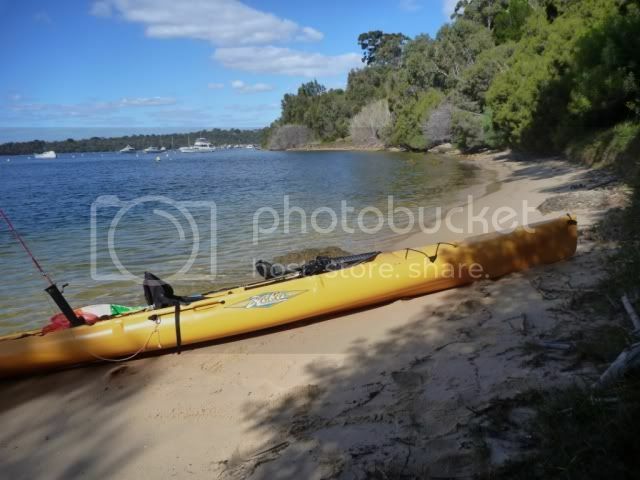 Yellow Hobie Adventure 'Achilles II'. Another sensational days bream fishing. 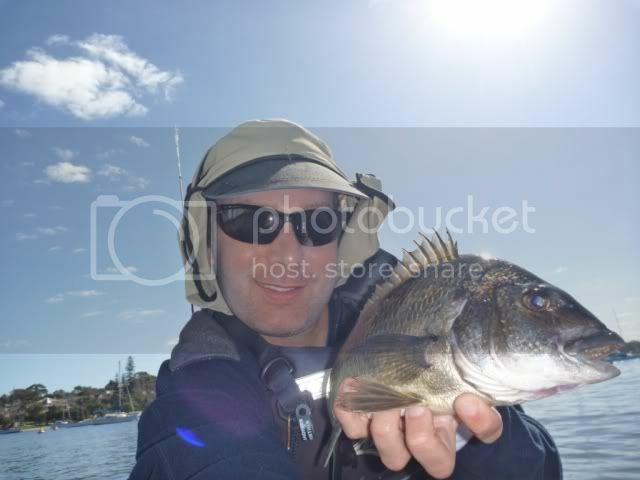 Great report and some cracking good bream again. Outstanding! Top session and some awesome photos too. Seems as though you have the bream bug Paul. Some quality bream fella...keep em coming !! You get my blood circulating with stories and great pics like that. Well done mate. Mind you that's not how I meditate but it likely has the same effect. WARNING: Do not meditate in your yak....you might fall out! Great story Tuckers... 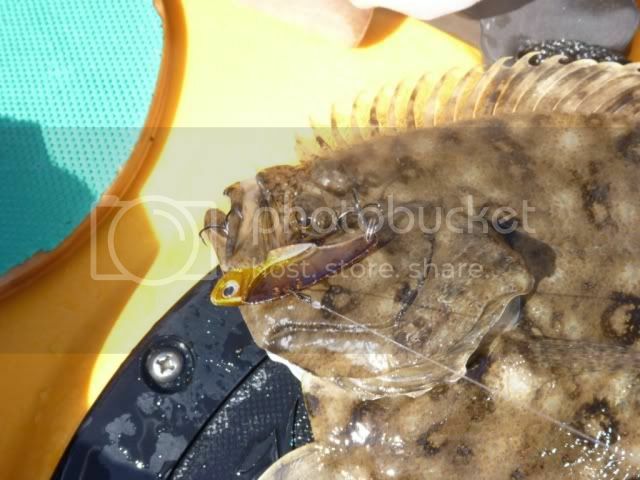 I had never heard or experienced a flounder in the West before and was quite dumbstruck when i recently caught a couple near here... they are the weirdest critters ever! Nice eating but.... hope you enjoyed dinner! I'm please you are competing in the next series of the KFT, they are some cracking barnacle munchers Paul, well done mate. waterbaby1972 wrote: Great story Tuckers... 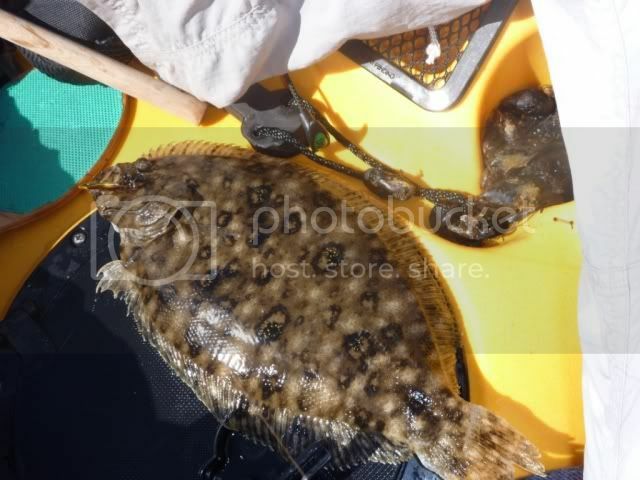 I had never heard or experienced a flounder in the West before and was quite dumbstruck when i recently caught a couple near here... they are the weirdest critters ever! Nice eating but.... hope you enjoyed dinner! Digger wrote: WARNING: Do not meditate in your yak....you might fall out! No need to do anything extra I reckon, kayak fishing is the most effective form of meditation out there. Clears the brain of absolutely everything else. Last edited by waterbaby1972 on Tue Aug 10, 2010 5:38 pm, edited 1 time in total. well, you certainly beat my PB of first flounder... first one 8cm - I kid you not! 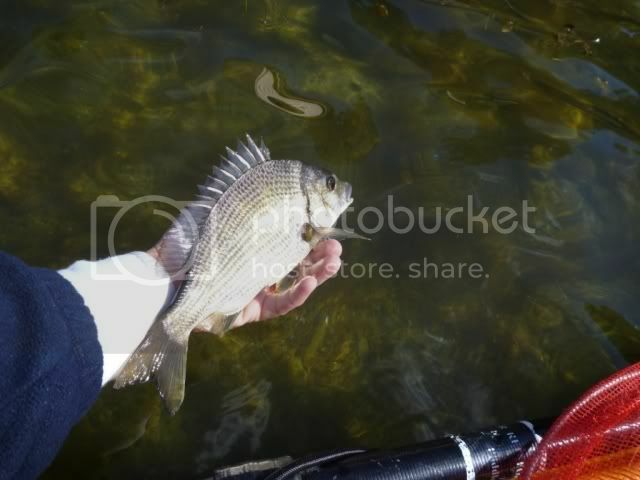 (I have this uncanny knack of catching the smallest of every species).the next one was size and very very nice eating. Had to google how to clean it but... both caught on trusty prawns. Nice report. And good work getting them on vibes! 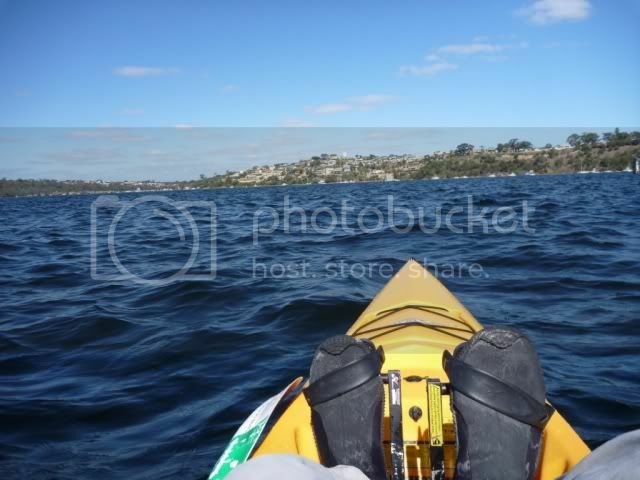 Kayaks: hobie outback R.I.P. now Revo Its blu too Rip New revo Not Fragile!! Kayaks: Stealth Evo 495,Ultra 4.3,Dirigo,Prowler 13 & Scrambler 11. Nice going Paul and flounder would have to be one of my favourite fish for the plate. Good results on the bream too.I'm still to squeeze in some practice with the bream in.